The iDataPrint™ Color Profile Wizard™, allows the casual user to achieve superlative color matching and image refinement previously attainable only by dedicated color experts. 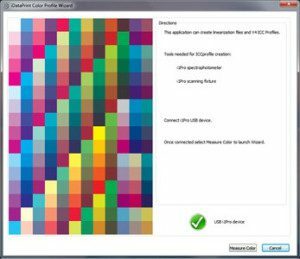 The iDataPrint™ Color Profile Wizard™ profiles your CMYK printer to your desired substrate in a few simple steps. Let the iDataPrint™ Color Profile Wizard™ take the guess work out of the equation and help you obtain better print quality without the hassle. iDataPrint™ Color Profile Wizard™ provides the needed bridge from Graphic Artist to printed product. Contact DDS or more information.